We enjoyed a final get-together with our Salty Dawg pals for an early Thanksgiving pot-luck dinner on the beach last Wednesday, and then said our farewells. Our plan was to leave for the 90NM inevitable beat to St Martin early on Thursday morning, hopefully when the seas and wind had abated. Well, we’ve discovered that we obviously need to do a lot more work on our passage planning. We knew we’d either have to leave in the dark or arrive in the dark, so we chose an ‘early-ish start’ of 4.30am (Chris Bucktin, you’d be proud of us!) expecting to arrive in Marigot Bay, St Martin about 12-15 hrs later with plenty of daylight to see us in. But the wind gods had other ideas, forcing us to sail more south than east, and finally motor-sailing east to get to our destination some 17 hours later, in the dark. The passage itself was a bit bouncy early on, and we encountered quite a few squalls in the late afternoon, but otherwise uneventful (we like uneventful). 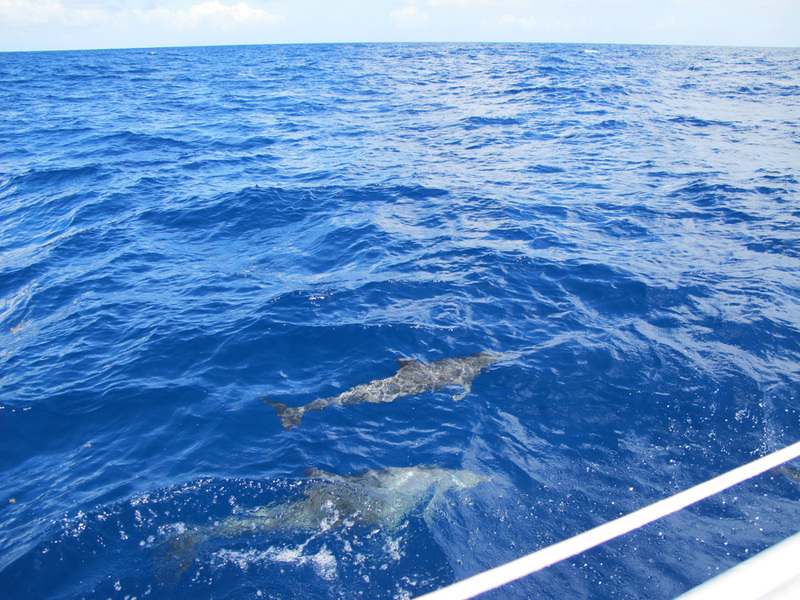 We had a pleasant interlude when a pod of dolphins joined us to play on our bow for a while, but as darkness fell and we approached St Martin we played another game – dodgems with all the cruise ships leaving St Martin for the BVI’s – their schedules must be the same as we counted at least 8 large ships heading out en masse. Coming into an unfamiliar anchorage in the dark is not ideal, not recommended, and definitely gets the adrenaline going. Marigot Bay is on the NW (French) side of St Martin and relatively easy on approach except that it’s incredibly hard to distinguish the anchor lights of moored boats from the shore lights, without the added problem of all those unlit boats. Not wanting to push our luck, we dropped anchor when we thought we were in the vicinity of a couple of other boats, only to discover the next morning that we were WAY WAY out in the back of the anchorage, probably about a ½ nautical mile from the shoreline! Ah well, better safe than sorry! 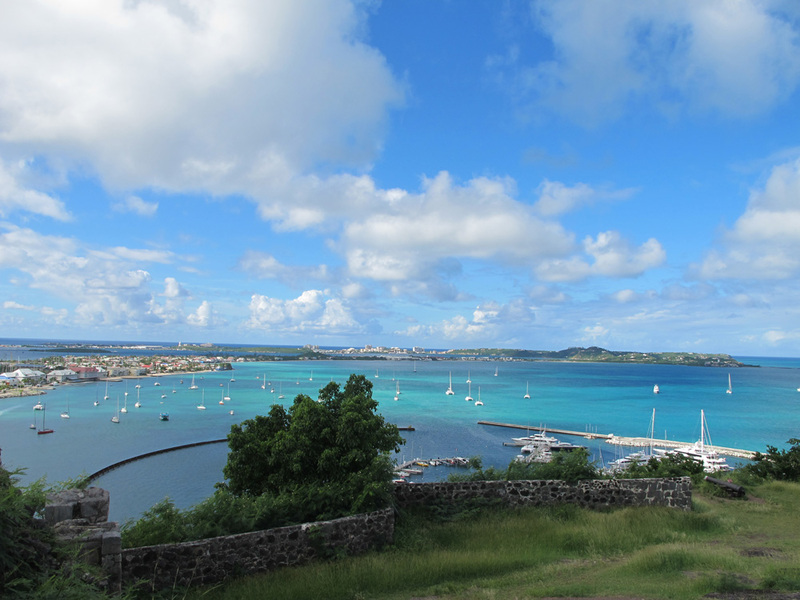 Marigot Bay is very pleasant – clear water (we could see our anchor well dug-in on the sand) and plenty of room. 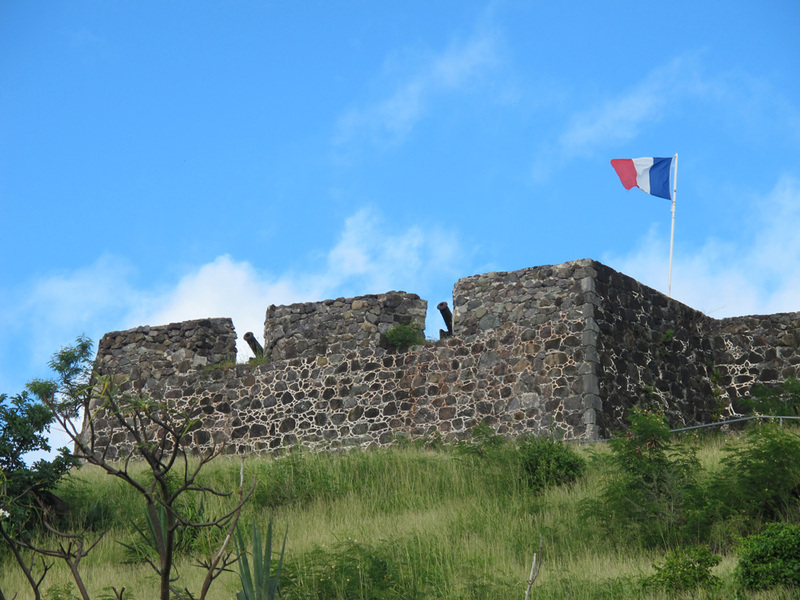 The other option that most people take is to sail further south and then into Simpson Lagoon, which requires passing through two drawbridges if you want to get to the French side (St Martin is half Dutch, half French). The second bridge joining the airport across the lagoon has only just been completed and doesn’t appear on any of the charts yet. That all seemed like too much hassle for us, even if the lagoon is more sheltered. The only drawback of Marigot Bay is that at weekends there’s a lot of high-speed motor boat traffic zooming from the lagoon across the bay, obviously using Toucan as target practice. The resulting washing-machine effect has given Bruce the opportunity to practice his best French swear words while shaking his fist in true gallic style. 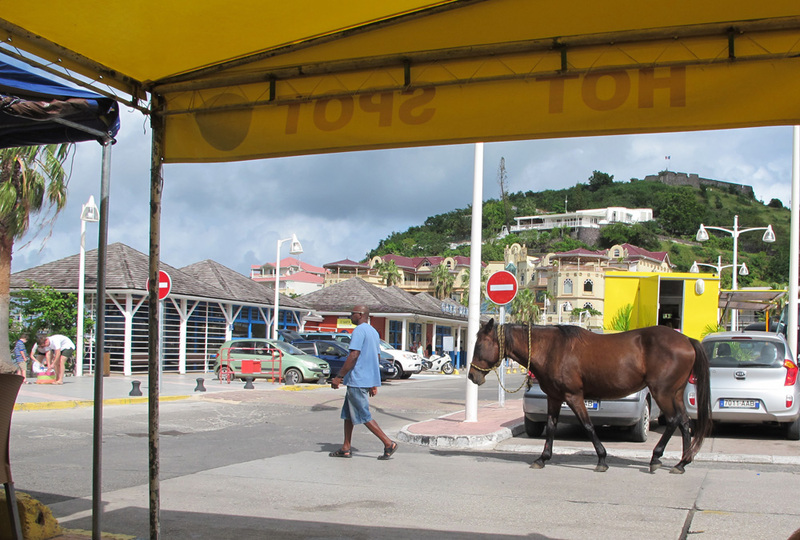 What’s also striking about St Martin is the contrast between the “have’s” and “have-not’s”. On the one hand it hosts big white super-yachts and cruise liners and has some of the biggest chandleries and the swankiest shops possible. The waterfront has all the designer label stores you can imagine, while two streets back the ‘have-not’s’ pilfer the dumpster bins and walk their horse down the street…. 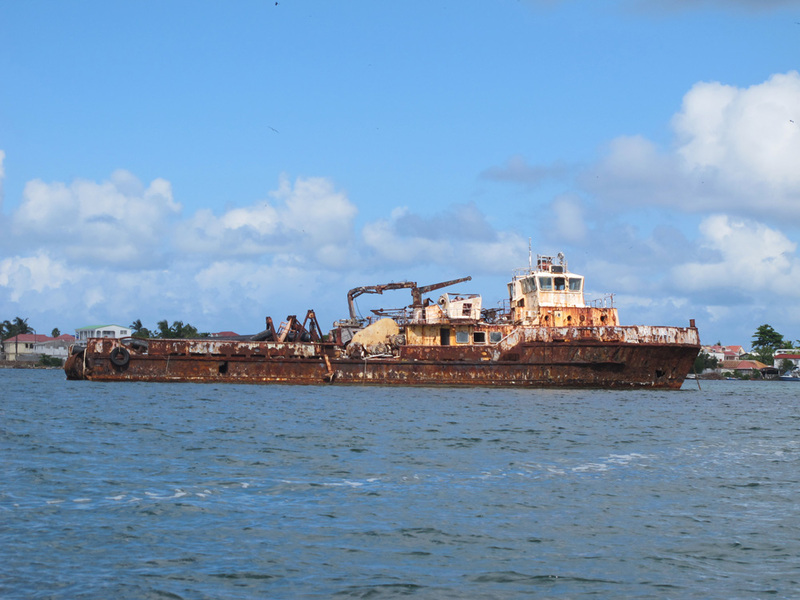 No-one seems too bothered to clean up the Lagoon either –amongst all the expensive yachts are hulls of boats left to rot, or more recent reminders of the devastation caused by Hurricane Gonzalo in October this year. Apparently up to 60 boats were lost when Gonzalo came roaring through, taking most people by surprise. 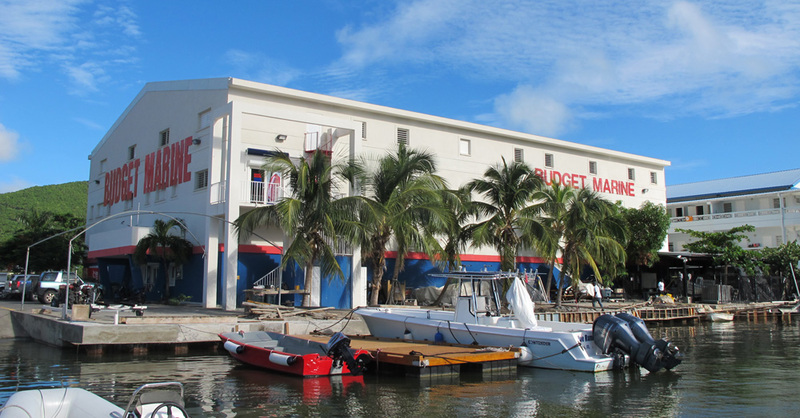 Our first day in St Martin (of course) was mostly taken up with a trip to the very large Budget Marine chandlery on the Dutch side of the lagoon where we managed to part with another small fortune. found a laundry and wifi at “Shrimpy’s” (the yachtie hang-out) had some delicious meals at Lagoonies café near Budget Marine and Ahrawak café in Marigot, and enjoyed coffee and delicious baguettes from the French bakery “La Sucriere” in Marigot where we can also pick up local wi-fi. Our phone and wi-fi connections have been pretty abysmal since being in the Caribbean, so today we splashed out on a wi-fi system for the boat that hopefully will allow us to pick up wi-fi signals from available stations on shore. We’ve also done some basic provisioning for the next few days, so the plan is to leave for St Bart’s on Thursday and then keep making our way down the Leeward chain to Martinique in time to meet up with Graeme and Wendy, our sailing buddies from Australia, for Christmas. Great photos and I love seeing a new blog post come in! Have a wonderful Christmas and I know you’ll look forward to the arrival of the others after a lovely few days with G and W as well. It will seem like a Pittwater Christmas after all!! lovely to here from you Cap’n Crabslayer – I guess the crabs have all gone to sleep for the winter now? 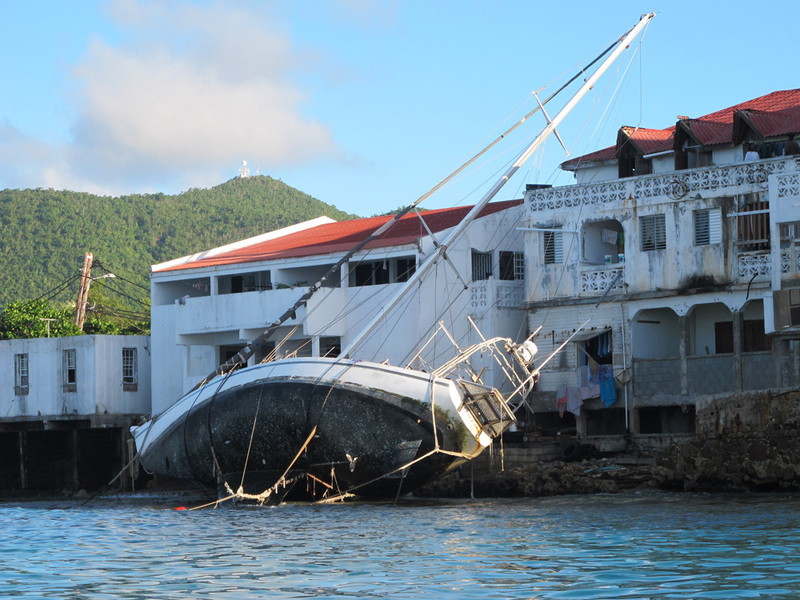 yes, I think there’d be plenty of salvage work in St Martin for you and Rudy. 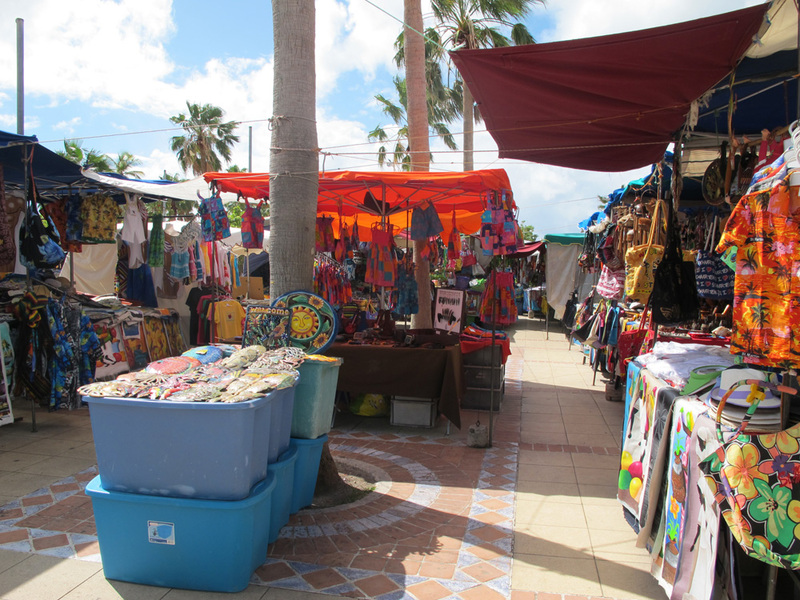 Hope you got the postcard from Virgin Gorda? will try and send you some more from our travels.